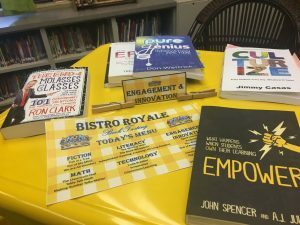 Provide staff exposure to a variety of engaging education related professional books in multiple content areas and genres. Allow teachers to individualize their professional development journey by providing them the opportunity to self-select a book from the provided options to have purchased and provided for them. 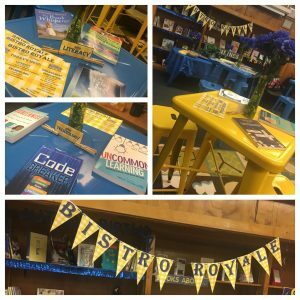 Supporting a community of teachers that demonstrate that everyone is a learner and everyone is a teacher. 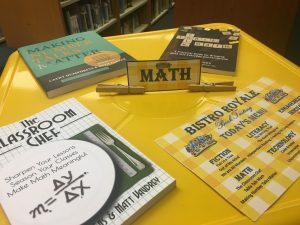 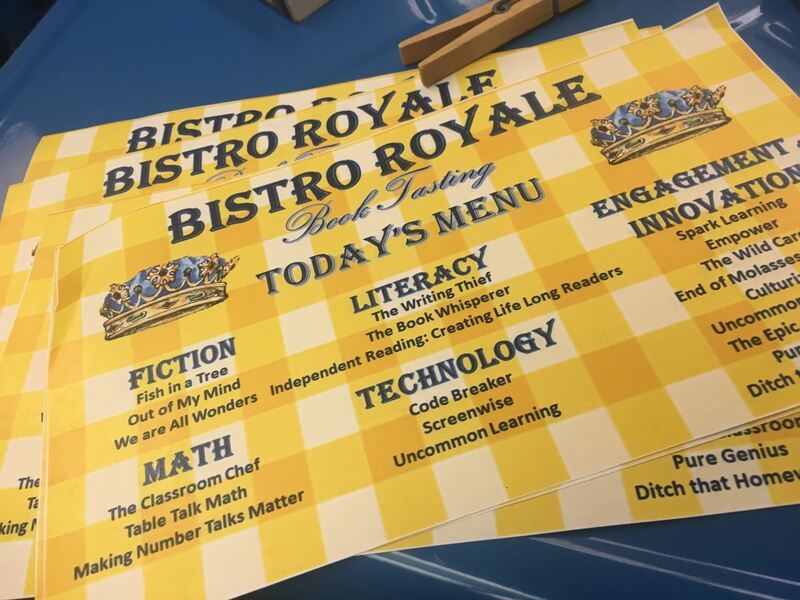 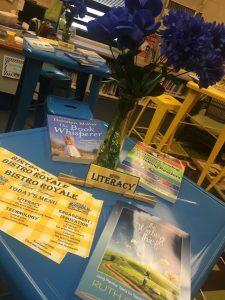 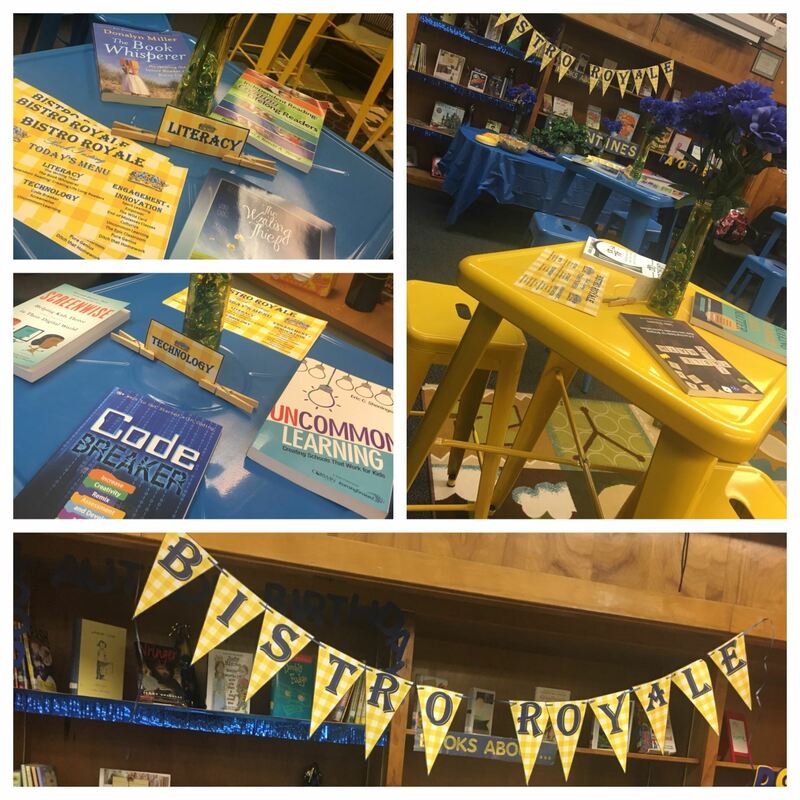 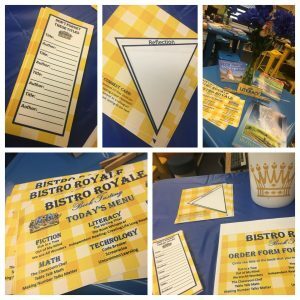 The setup set the stage to engage teachers in an informal, yet structured learning experience designed to also model for them how they may implement a book tasting within their classroom. 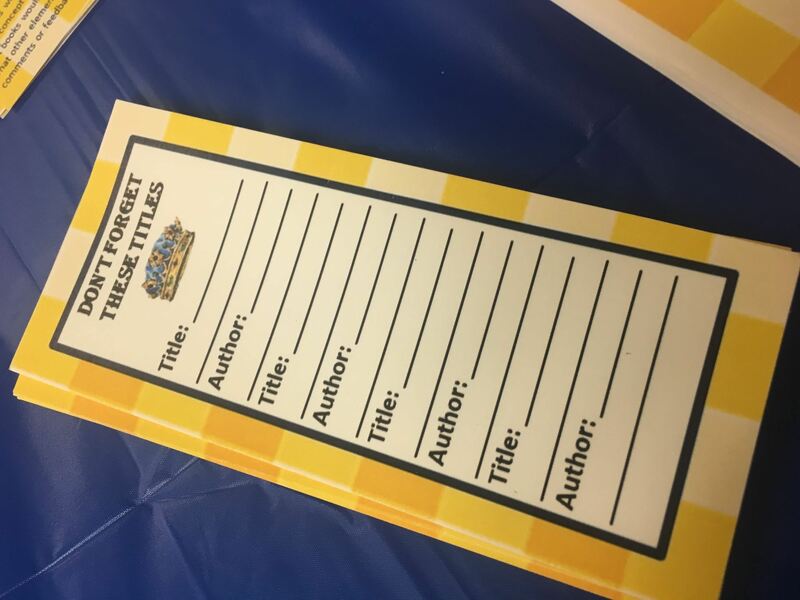 The staff were invited to record their favorite titles on a small book mark that I created for them to take notes. A ‘reflection’ napkin was provided for teachers to take notes regarding any conversations or ideas they had as they sampled the books. 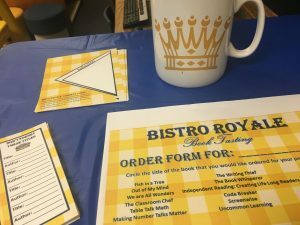 A final order form for teachers to record their selections was also included. 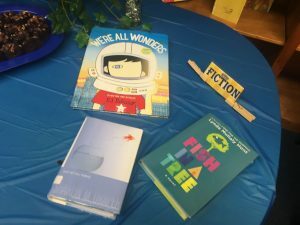 These were all made available as they entered the room. After a brief introduction and welcome, staff were asked to visit each table and sample the books that were displayed on table according to content area and labeled as such. As teachers reflected and shared their thoughts of the books with their colleagues by flipping through the book, reading the back covers, or hearing feedback from peers that had already read the book, teachers were asked to place an “order” for their individualized professional development selection by circling their choice and returning it to the ‘hostess stand.’ I will be placing an order for each teacher to receive their selection to add to their professional library. I also made it known that any of the books that were shared were already a part of our school library or my professional library and they had access to them should they want to borrow any other books other than the book they selected to have purchased for them. 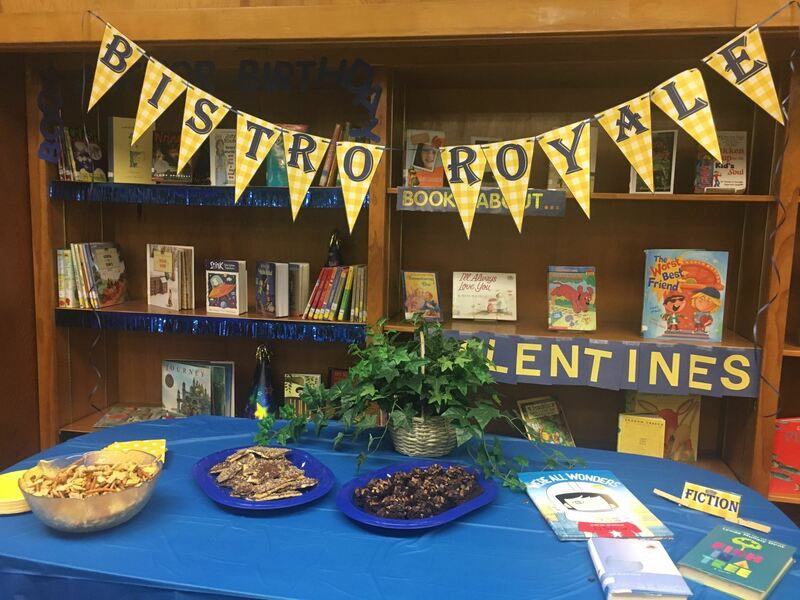 I have to thank our school secretary for the delicious treats and chex mix she made to be shared at the Bistro! 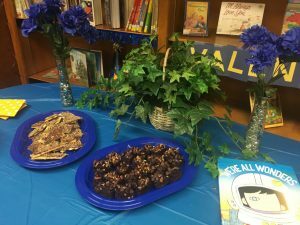 They were tasty and a true hit! 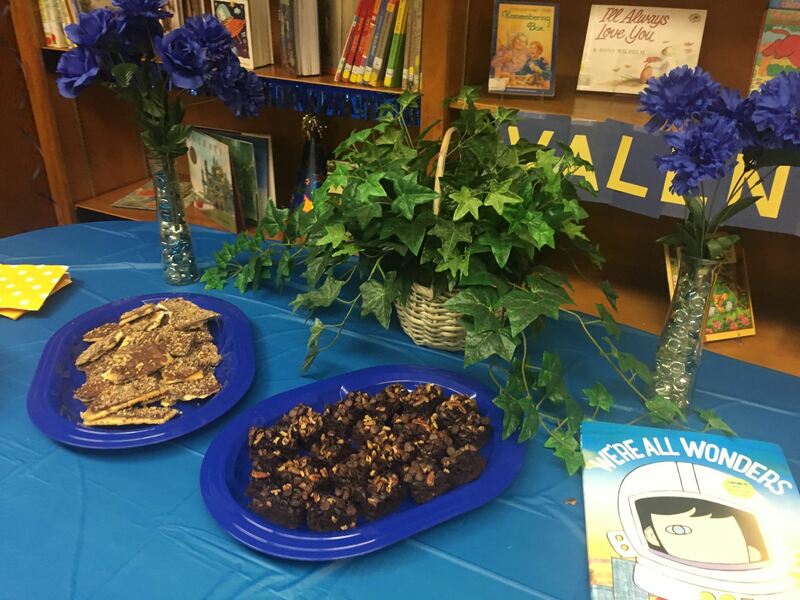 Staff meetings are always better with food! 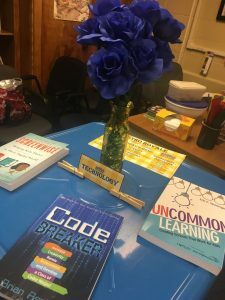 For easy centerpieces that you can use repeatedly, I purchased yellow vases at Dollar Tree and filled them with blue flowers to coordinate our school colors. It will be beneficial to follow-up with staff following the purchase of their books and time to read their selections with a round up and book talk in which each staff member shares their reflections and take-aways from their books.